Today in History–May 13–the Library of Congress features Arlington National Cemetery. On this day in 1864 a Confederate prisoner of war was buried on the grounds of Arlington House in Virginia, on the Potomac River opposite Washington, D.C. Today, the cemetery is the final resting place for soldiers from every war in which the United States has participated, including the American Revolution and each year Memorial Day is honored by placing a wreath on the Tomb of the Unknowns. In addition to soldiers, you will also find the graves of some presidents and first ladies, including John F. Kennedy and Jacqueline Kennedy Onassis. 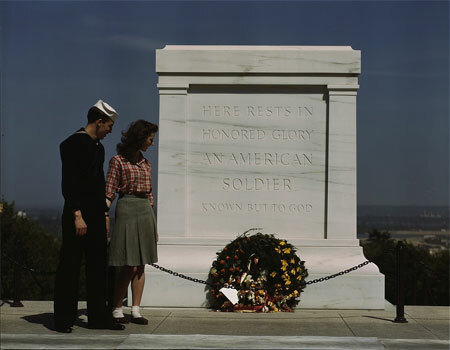 Learn more by visiting the Today in History section, then click the links below to access primary sources related to Arlington National Cemetery.